Hon. 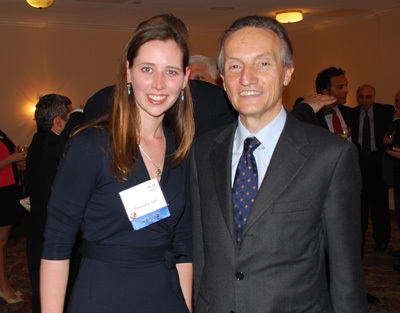 Claudio Bisogniero, Ambassador of Italy to the United States, was the guest of honor at a Congressional Reception welcoming him to Washington, D.C., April 26, 2012. This private event, held at The U.S. Capitol in the Rayburn Building, was hosted by the National Italian American Foundation (NIAF) under the auspices of the Frank J. Guarini Public Policy Forum and the Italian American Congressional Delegation (IACD). U.S. Representatives Pat Tiberi and Bill Pascrell, co-chairmen of the Italian American Congressional Delegation (IACD) of the 112th United States Congress, were joined by Democratic Leader Nancy Pelosi, Representatives Michael Capuano, David Cicilline, Rosa DeLauro, Mike Doyle, Virginia Foxx,John Mica and Jim Renacci at the reception. From the podium, President Joseph V. Del Raso, Esq., welcomed NIAF’s leadership including Gabriel A. Battista, John F. Calvelli, Robert E. Carlucci, Joseph M. Della Ratta, Hon. Mike Ferguson, Hon. Patricia de Stacy Harrison, Hon. Anita Bevacqua McBride, Dr. John P. Rosa and Mark Valente III, as well as the Foundation’s newly-appointed Chief Operating Officer John M. Viola. Calvelli, who serves as the Foundation’s Secretary and Chairman of the Government Affairs Committee, opened the reception and served as the evening’s master of ceremonies. Rep. Pascrell gave a few remarks on behalf of the IACD. “We are all very proud of you, Ambassador Bisogniero, and it feels as if you have been here with us for years, may Italy and America be friends forever,” Pascrell remarked. The Ambassador spoke about the values of freedom and democracy, friendship and strength shared between the Italian American community and Italy as well as the incredible role Italian Americans play today. He also outlined the positive increase of students taking the Advanced Placement (AP) Exam in Italian in schools across the United States.